Wow. Welp. 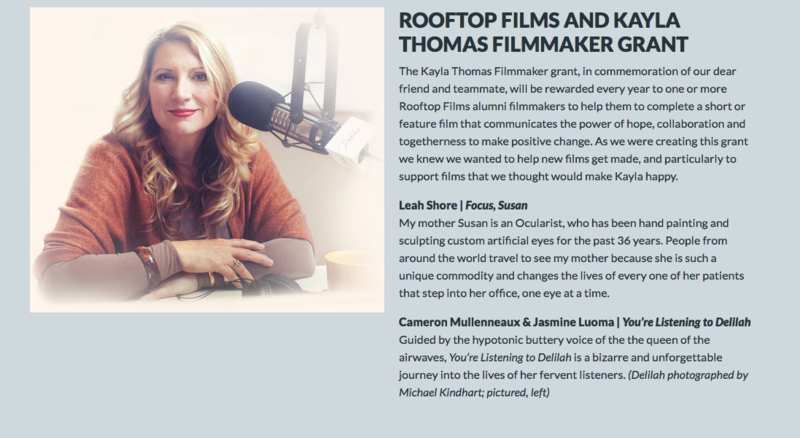 I just got awarded a grant from the wonderful Rooftop Films, thank you! I will be making a short doc about my mother, Susan Frost and what she does for a living. She’s an ocularist, she makes artificial eyes, meaning she hand sculpts, paints and molds the eye for her patients. It’s intimate. It’s emotional and she literally changes the patients life. I cannot wait to make this film and am thankful my mom is down to make it as well! Thank goodness for artists as parents! YAY! I was interviewed by PBS about filmmaking and more! Featuring my films HALLWAY and I Love You So Much . Film date…December?? So proud to be back, Rhode Island! I directed another spot for CNBC’s Money Lab Watch! I had the pleasure of directing another spot for CNBC’s Money Lab. Thank you CNBC, the wonderful team, my producers and really just everyone, especially Anne Wojcicki. 23 and me!